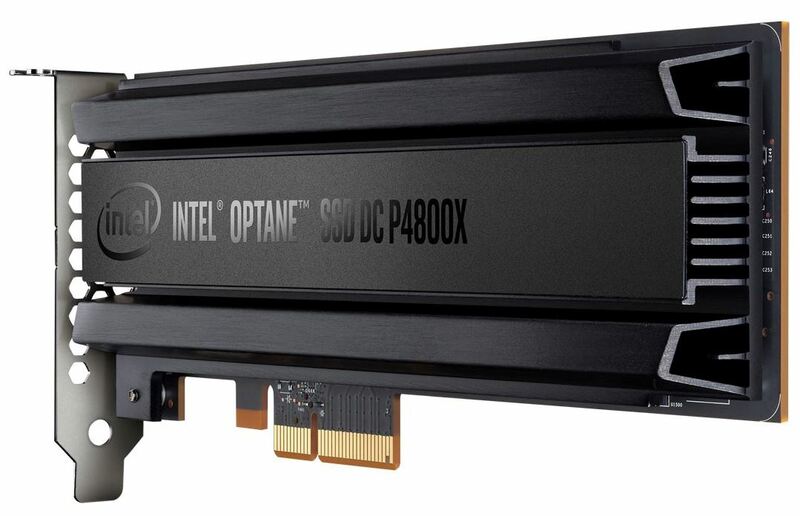 The first independent (well, almost) test of the Intel Optane SSD is out and by the looks of it the new memory standard has passed with flying colors. If this review is anything to go by, then the memory type is definitely game changing, although not entirely in the manner most of us thought it would be. It definitely gives an upgrade over traditional SSDs in terms of endurance, speed and latency but probably the most critical update lies in the consistent performance this memory type can offer, which is miles ahead of what any conventional SSD can currently achieve. Before we go any further, the benchmarks below have been sourced from Tom’s Hardware and you can head over to their site to read the full review should you want to (I definitely recommend doing so). While this review was conducted by a third party, it’s not a completely independent one. Intel only allowed remote access to the drive and did not even give them the user manual to consult, which limits the amount of information they can report on. While I am sure all the tests were run on a real Optane SSD, it does create an unnecessary air of uncertainty which should usually be avoided. In any case, this will have to do for now and boy are the preliminary numbers good! Without any further ado, lets jump in. Endurance rating of the Intel 3D XPoint DC P4800X. Table courtesy of Tom’s Hardware. 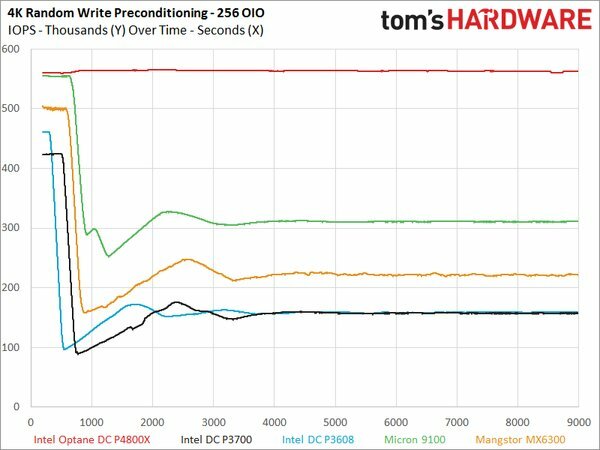 The first thing you will notice is that the Intel DC P4800X easily has the most endurance around, as compared to traditional SSDs, but this isn’t a structural break in the trend by any means. In fact, the DC P3700 is based on plain ol NAND memory and offers 20% less endurance for almost 4.2x times the amount of total memory. Of course, the DC P3700 will set you back 2 grand ($2065) while as the DC P4800X will retail at around $1520 so you are basically paying around $4 per GB on the DC P4800X and around $1.69 per GB for the DC P3700. This is a steep price to pay for what is essentially, ultra fast storage. 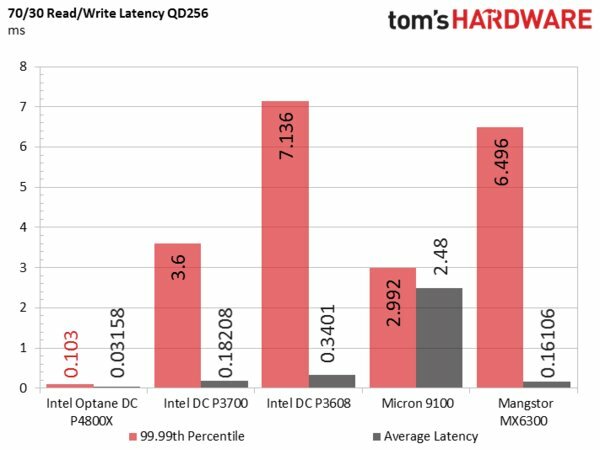 Read/Write Latency of the Intel Optane DC P4800X. Courtesy of Tom’s Hardware. Up next, we have the 70/30 Read/Write latency benchmark for the 3D XPoint Memory based SSD and it is here that we see the first signs of a complete structural break from the existing trend. The P4800X Intel Optane SSD is miles ahead of its competition in terms of sustained Read/Write latency as well as the average count! In fact, it is exactly 36x times faster in sustained latency than the DC P3700 and almost 71 times faster than the DC P3608. This is a trend that we will continue to see in the next few benchmarks as well. All benchmarks below are courtesy of Tom’s Hardware. Whereas traditional SSDs hit peak performance during the initial moments after a load is applied, they quickly settle down to a performance level that is many tiers below the original speed. 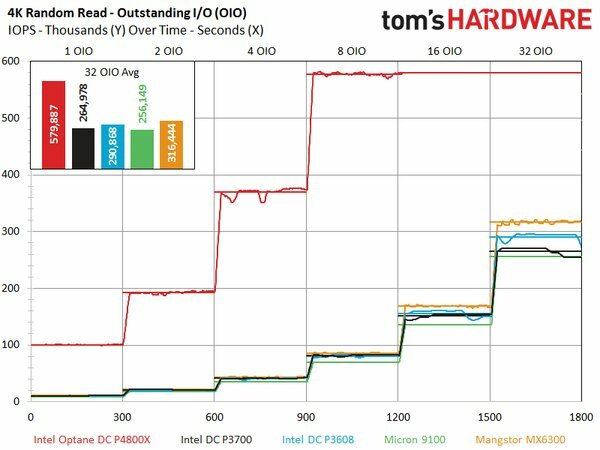 The Intel Optane memory appears to be completely immune to this effect and has no trouble delivering the rated speed consistently throughout the testing done by Tom’s Hardware. In fact, this might be the first SSD where you actually get the performance that is advertised 24/7. 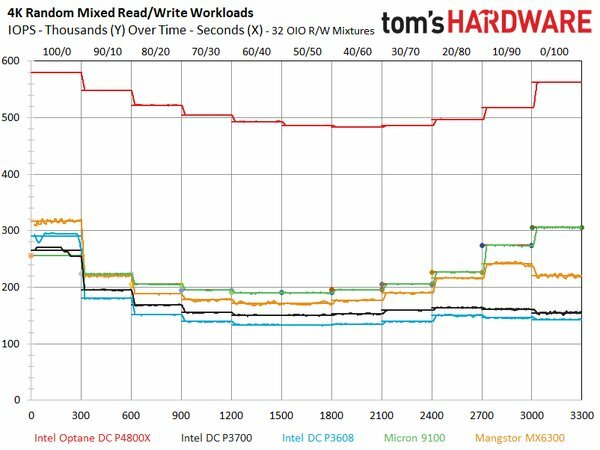 Looking at the Random Read, Write and Mixed benchmarks as well we see the same trend: The Optane memory based DC P4800X is in another league when compared to its NAND based siblings and can be safely called a disruptive innovation in this area. Intel has successfully innovated a new memory standard. Currently however, the tech is a bit too expensive for the average consumer. Dropping a grand and a half for a measly 375 GBs of memory is not something the vast vast majority of consumers would do – even in the high end segment. But what these performance numbers do achieve is a proof of concept. This is real live testing done by real world reviewers that show the Optane Memory does manage to deliver on the hype, albeit at a very steep price. While it is bleeding edge tech at the moment, the price will eventually come down to more palatable levels and I have no doubt it will be able to disrupt the NAND industry then. That said, if Intel’s own plans with traditional SSDs is anything to go by, this is not something that is likely to happen for the next couple of years.